e is sometime named after Leonard Euler (Euler’s number). He wasn’t the first mathematician to discover e – but he was the first mathematician to publish a paper using it. 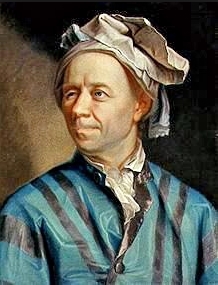 Euler is not especially well known outside of mathematics, yet he is undoubtedly one of the true great mathematicians. He published over 800 mathematical papers on everything from calculus to number theory to algebra and geometry. Why is e so important? Lots of functions in real life display exponential growth. Exponential growth is used to describe any function of the form ax where a is a constant. One example of exponential growth is the chessboard and rice problem, (if I have one grain of rice on the first square, two on the second, how many will I have on the 64th square?) This famous puzzle demonstrates how rapidly numbers grow with exponential growth. for between x = 0 and 3. You can see that y = ex is between y=2x and y = 3x on the graph, so why is e so much more useful than these numbers? By graphical methods you can find the gradient when the graphs cross the y axis. For the function y = ex this gradient is 1. This is because the derivative of ex is still ex – which makes it really useful in calculus. e appears in a host of different and unexpected mathematical contexts, from probability models like the normal distribution, to complex numbers and trigonometry. Euler’s Identity is frequently voted the most beautiful equation of all time by mathematicians, it links 5 of the most important constants in mathematics together into a single equation. Infinite fraction: e can be represented as a continued infinite fraction can students you spot the pattern? – the LHS is given by 2 then 1,2,1 1,4,1 1,6,1 etc. A limit: e can also be derived as the limit to the following function. It was this limit that Jacob Bernoulli investigated – and he is in fact credited with the first discovery of the constant. You can explore more of the mathematics behind the number e here. Ramanujan’s Beauty in Mathematics Some of the amazingly beautiful equations of Ramanujan.